As news broke of the alleged Russian dossier on Donald Trump of compromising information about both communications with the Kremlin and “golden showers,” Seth Meyers was preparing to tape his show. Kellyanne Conway, who will soon step into a role as “counselor to the President” was scheduled to appear. How do you think that interaction went? 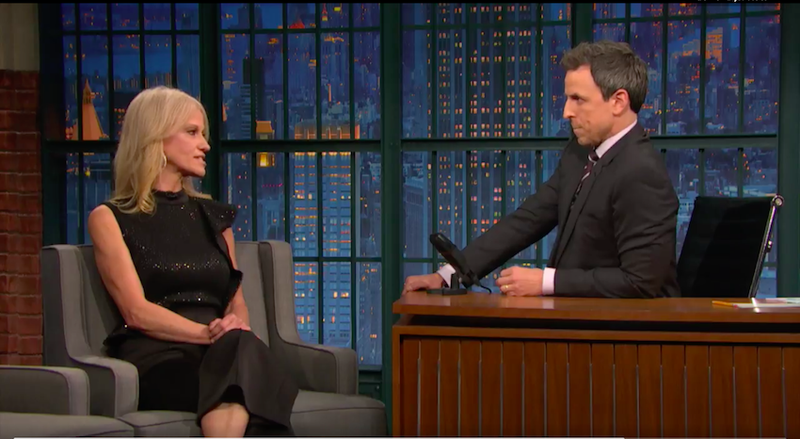 Seizing the opportunity to address these allegations with the one woman whose literal job seems to be trying to clean up the giant puddle of mess her boss leaves in his wake, Meyers asked Conway to speak on the allegations. It went about as well as you’d think. Of the fairly damning allegations, Conway said “As an American citizen...we should be concerned that intelligence officials leaked to the press and won’t go tell the president-elect or the President of the United States what the information is,” she continued, wheels spinning, despite the fact that CNN reported earlier this evening that the information was presented to both Turmp and President Obama in earlier briefings. “But the press report was about them going to the president,” Meyers said, firmly refusing to back down from the facts. Conway mumbled something about how the President-elect was never briefed on the allegations —that they were appended to the bottom of an intelligence briefing— in an attempt to set up her defense, which was swiftly batted away by Meyers. “I believe it said they did brief him on it,” he continued. He’s right, by the way. Apparently, they did. “He has said that he is not aware of that,” she said, indicating that the president-elect is “not aware” of information that was ostensibly relayed to him in a briefing that he did indeed attend, with an intelligence briefing that he ostensibly should have read. “That concerns me,” Meyers said, saying what we’re all thinking, but measured, polite and cool as a cucumber —admirable, given how decidedly alarming this entire situation is.